Rent Meeting House Grand Ballroom | Corporate Events | Wedding Locations, Event Spaces and Party Venues. The Meeting House Grand Ballroom is an elegant, Victorian inspired, single event banquet hall located in historic downtown Plymouth Michigan. The Grand Ballroom is an ideal venue for hosting wedding receptions, corporate functions and anniversary parties. The Meeting House is an historic, single event, wedding reception and ceremony site located in downtown PLYMOUTH, MI. 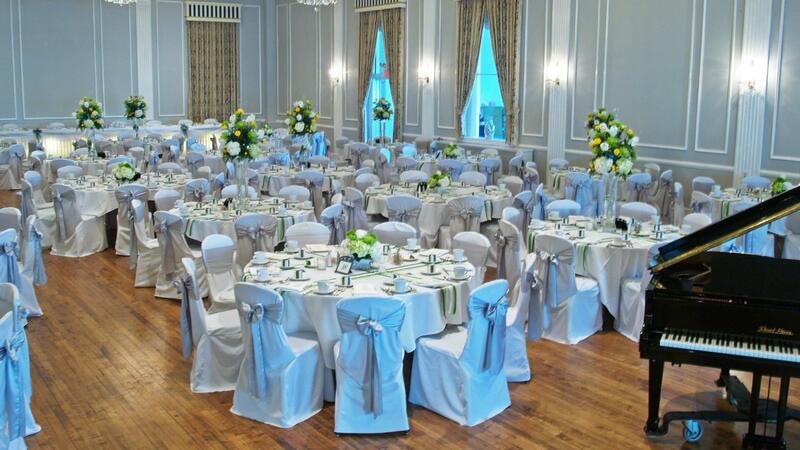 The Grand Ballroom accommodates up to 300 guests including a large dance floor. The Meeting House is a beautiful victorian ballroom featuring crystal chandeliers, fireplace, grand piano and a balcony for the bouquet toss. Our culinary arts graduate chef for the past 16 years has earned a reputation for exceptional events. Please allow us to share with you our extensive references. The Meeting House offers diverse menu options, including hot and cold hors d'oeuvres, carved prime rib buffet and family style meal service. The chef takes great pride in satisfying your most discerning guests. The bread assortment is freshly baked each day on the premises. Portions are both generous and beautifully presented. Many event planners gravitate towards the most formal, chef plated menu option featuring white glove service, two main course selections plus a delectable vegetarian phyllo strudel finished with black and white sesame seeds. Late night snacks include house-made pizza and jumbo hot pretzels. You will delight in your guest's rave reviews of their evening spent at Michigan's finest wedding reception and ceremony site. Outdoor ceremony and or photos in neighboring Kellogg Park. One totally private wedding reception daily. Owner operated with impeccable reputation. Experienced: Over 1,000 wedding receptions! Absolutely meticulous attention to every detail. Large portions, expertly prepared and presented utilizing only the highest quality ingredients. Complimentary wedding reception hotel shuttle service from Plymouth and Livonia area hotels. Incentives available for Low Season plus Fridays and Sundays. Accommodations for 150 to 300 guests with a dance floor and wedding reception head table. Centrally located: convenient to and from Ann Arbor, Northville, Novi, Canton, Farmington, Dearborn, Westland and Livonia.